This small public park, located at the intersection of Pennsylvania Route 6 and Mill Street, in Port Allegany, is truly a one-of-a-kind destination. 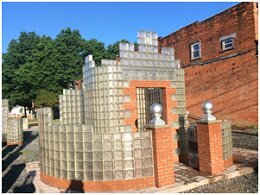 Glass block manufacturing was long a product proudly manufactured in Port Allegany. 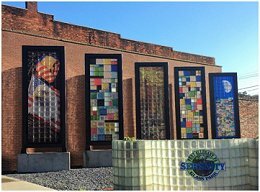 This rich local history-of a worldwide product-and other local attractions and manufacturers are showcased in the artwork etched into the glass block towers. Creative artwork, beautiful lovely walkways, and a glass castle all add to the experience. Suitable for all ages, custom glass planters, hand carved benches and trees made of wire and glass contribute to the ambiance. History of the Serenity Glass Park dedicated on September 15, 2017.